Professor Robin Bell is a medical epidemiologist with over 30 years experience working in women’s health. Robin is the Deputy Director of the Women’s Health Program within the School of Public Health and Preventive Medicine at Monash University and is also Associate Dean of Research (Clinical and Public Health) within the Faculty of Medicine, Nursing and Health Sciences at Monash. Robin currently holds a Victorian Cancer Agency Public Health Fellowship. She is the coordinator of teaching in Population Health in the undergraduate MBBS program at Monash. Robin is experienced in the design, execution and analysis of randomized trials and the execution of large cohort studies. 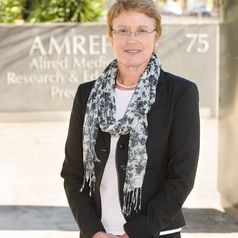 She is currently responsible for a 5-year study of over 1600 women with their first diagnosis of invasive breast cancer (currently funded by the BUPA Health Foundation and the Victorian Cancer Agency). One of her research interests is screening, especially in relation to breast and ovarian cancer. Other research interests in relation to women at midlife include urinary incontinence, cardiovascular disease and metabolic disturbance, bone and joint health and cognitive function.